BCV principal Hans Baldauf reflects on his recent visit to Milan for Expo 2015. Flying back from Italy, I am struck by my rich, yet seemingly incomplete experience at the Expo. Speaking with friends the other night over dinner in Rome, I was asked if the Expo would push the sustainable food movement forward. I said yes – just a result of the exposure – like all essential things in life there are many ways of looking at things and the Milan expo highlights this range: from the McDonalds pavilion, which states that it feeds more people a day than any other institution in the world, to the small scale Italian farmers of the Slow Food movement (which was created partially in opposition to the arrival of McDonalds in Rome), which argues for biodiversity and the importance of regional and local products. Another marker at the expo is the presence of the food world phenomenon Eataly. I found Eataly’s presentation at the expo confusing. It occupies the bulk of two long common buildings, made of laminated timber, that elsewhere are used for small separate exhibitions. Here they are used for multiple regional Italian cafes and exhibits of regional food producers. The building is dominated by a large portable flower, which is the only feature to provide focus. In Rome I visited the huge version of Eataly that occupies the 1940 Ostiense Railroad Station. Inserted within the volume of the station is a four story version of Eataly which is both dramatic and convincing as a new kind of institution. Eataly is a supermarket of Italian products combined with a series of production facilities (mozzeria and a brewery), along with a series of cafes that show off particular products – pasta, meat, and fish, among others. There are stores in stores like the Illy coffee shop and a book store by Coop. A financial institution provides a lounge to rest in. A children’s food educational classroom and a large cooking school occupy a part of an upper floor. The fourth floor includes showrooms for appliance dealers and a large meeting hall. Eataly brings Italian food together in a format that was once known in America as a category killer – you need go nowhere else. 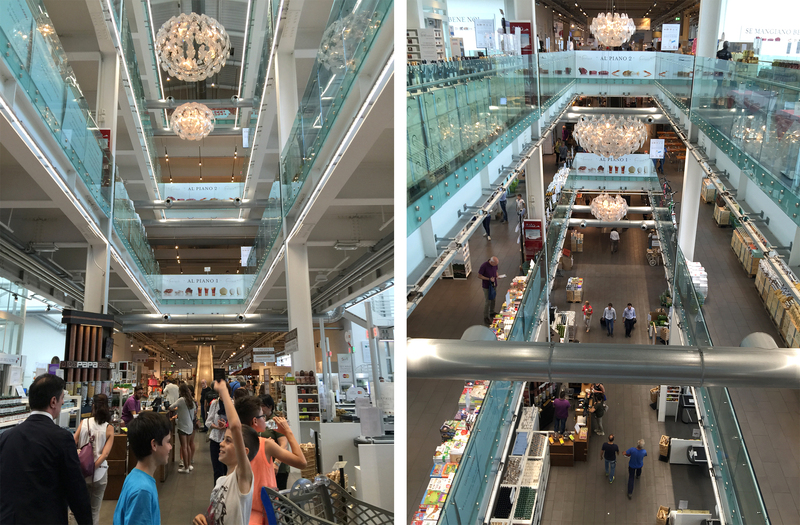 The genius of Eataly is that (in Rome at least) you can see the experience as fun. The format of the old railroad station gives structure to what seems overwhelming in other locations. Italians used to and still revel in their own local cuisine – the subtle variations of their bread, their olive oil, etc. Eataly represents the cultural embrace of the diversity of Italian cuisine at a popular scale. A young professional in Rome is now an expert on Sicilian Cuisine. This is the profound change that Eataly represents and was much more evident in the store than at the Expo. Visiting the “Supermarket of the Future,” created by Coop for the Expo, was one the most interesting experiences we had. Coop stores are everywhere in Italy. While I speak above of the popularizing of an appreciation for regional Italian cooking, Coop is the institution that has grown up alongside and begun to displace some of the traditional food merchants. One no longer has to go to the butcher, the baker, the produce vender and the general grocer (alimentari); Coop provides one-stop shopping. At the Expo, Coop displayed how this might take place, using interactive technology. Merely pointing to a product activates a signage system that provides the shopper with a remarkable amount of detailed information on provenance, carbon footprint, potential allergens, and nutritional information, all in easy to read graphics. The goal, according to our guide, is also to vastly reduce the number of carts, because one can select the product and it will be delivered to check out. This functionality was not on display – one wonders what the difference between shopping online and coming to the Coop will be. There was also a display discussing intelligent refrigerators, which will monitor what you have, when you have to use it by, and what you can make. They will also generate your shopping list. All of this is presented very elegantly in beautiful lighting. The supermarket of the future is designed to provide the maximum amount of information in the most convenient way – What it does not provide is taste; you have to know that for yourself. The Milan expo confronts a daunting series of issues seen from many lenses. There is no single vison other than an awareness of the Expo’s importance and that we are in an era of increasingly scarce resources that we need to use wisely. This brings one back to the United Nations’ Pavilion Zero, with its challenge to eliminate hunger and their observation regarding how much food is wasted. If there is a common theme it is one of awareness: being an informed participant in our food system.